How Do I Become a Polysomnography Technologist? Individuals who already have medical credentials may elect to become a polysomnographic technologist. If you wish to become a polysomnography technologist, there are several paths that you can take, each involving a certain amount of formal training, clinical experience, and testing to obtain certifications. Finding the right path for you depends on where you live and how much schooling or experience you already have. The Internet is a great resource for finding current information about programs and local requirements, but you may also need to contact local hospitals, sleep centers, technical colleges, or universities to find out all the relevant information for your region, experience level, and skill set. To become a polysomnography technologist without any previous medical experience, some programs follow a nine-month plan. To start, you will need to have the equivalent of a high school education. You may then take an introductory accredited course in basic sleep technology and begin working as a technician in a sleep laboratory. At this point, depending on where you take your introductory course, you might become a CPSGT (certified polysomnographic technician), which is an entry-level certification for new workers. After nine months of employment in a sleep laboratory working to become a polysomnography technologist, you can pass a test and take a self study course that will prepare you for the next step, which is a national exam. In the United States, the national exam is given by the BRPT (Board of Registered Polysomnographic Technologists), and it will qualify you to be a RPSGT (Registered Polysomnographic Technologist™). If you are a CPSGT seeking to become a polysomnography technologist, your CPSGT certificate is only good for three years; in other words, that is how much time you have to pass the exam. Another route that you can take to become a polysomnography technologist is designed for sleep technicians already employed by sleep labs. Depending on how long you have worked, you might be eligible to skip a couple steps and advance directly into taking online self-study materials that will prepare you for a national exam. With enough lab experience, you might be able to register to take the exam without introductory courses required for someone starting from scratch. A third path that you can take is reserved for healthcare professionals that already have certain medical credentials. A list of these credentials is available online. If you qualify for this track, you might only need six months of part-time clinical sleep lab experience to qualify to take the national test. In most countries, polysomnography technologist duties include diagnostic and therapeutic services, patient care, research, and more. To become a polysomnography technologist requires extensive training and experience. Generally you will need to complete an accredited educational program and receive a degree or a recognized certificate of competency. Often you will also need formal sanction from a national institution or agency. Investigating the different paths open to you can be done online, or through local schools, hospitals, or sleep laboratories. How Do I Prepare for a Medical Technologist Exam? How Do I Become a Sleep Technologist? 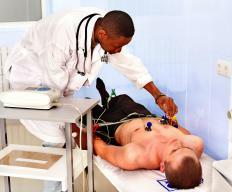 What are the Different Types of Polysomnography Jobs? What is a Sleep Technician? How do I get Polysomnography Training? How do I Become a Polysomnographic Technologist?